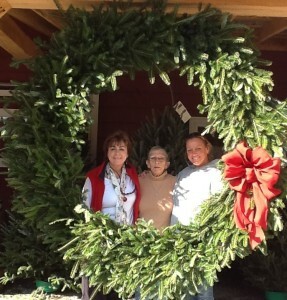 Each November, we begin making beautiful, fresh Fraser Fir Wreaths & Garland to sell all season long. Fraser Fir wreaths and garland are the longest lasting evergreen decorations on the market. You can buy them here at the Farm. We’ll even ship them to you or to your gift recipient. Wreaths and Garland can be shipped anywhere east of the Mississippi. To ensure freshness, the shipments are prepared on Tuesdays starting the week of Thanksgiving. We will carefully pack and ship your fresh greenery anywhere in the continental US east of the Mississippi for $20. and west of the Mississippi for $30. Call us to place your order at (828) 743-5456 – either for shipping or for picking up at the Farm when you come to visit.